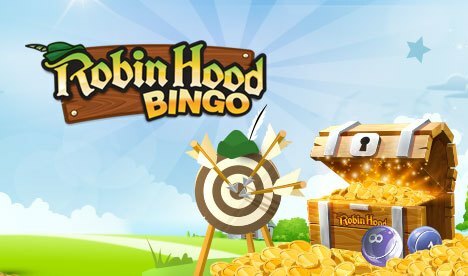 Robin Hood Bingo | Enjoy 3 Days of Free Bingo Games! Head deep into Sherwood Forest and play at Robin Hood Bingo! Robin, Marian, and the Merry Men want to share the wealth so you can expect some amazing bingo treats! Start off with 3 days of free no deposit bingo with chances to win for real! Join and get a fabulous Welcome Bonus that gives you £40 and 50 FREE Spins! As soon as you sign up at Robin Hood Bingo you’ll be showered with fabulous freebies! Register and access 3 days of free bingo before you even make an initial deposit! Then when you’re ready to play to become a funded member, you’ll get a Welcome Bonus for £40 and 50 FREE Spins! Pretty amazing, huh? There are lots more exciting bonuses, promotions, and features on the site that add extra fun and winning potential. Earn a spin on Robin’s Prize Wheel as soon as you fill up the progress bar. Spin the wheel to win one of 12 incredible prizes – guaranteed! Play loads of fun bingo jackpot games that happen every day, week, and month. The Daily Grand happens every night and boasts a £1,000 jackpot while Pay Day Bingo’s £10,000 prize is up for grabs every month. Self Made Millionaire is our biggest bingo jackpot with a crazy big jackpot of £1,000,000! Robin has 4 free bingo rooms where you can play for free and win real prizes. Enter The Biggie, The Ultra, The Grand, and the Supreme rooms for loads of freebie fun! There is £900 given away daily so you definitely don’t want to miss out! Discover a fab selection of online bingo games, from the UK’s popular 90 ball version to the American style 75 ball bingo. There are games playing all day long with exciting progressive and guaranteed jackpots up for grabs. For casino games lovers there are hundreds of slots, scratch cards, and table games to choose from for loads of fun and heaps of winning chances. You’ll find all the top slot games from industry leading games developers like NetEnt, Microgaming, Eyecon, and more! Enjoy the casino classic such as online Roulette, Blackjack, Poker, and Baccarat too! Robin is always giving away bingo bonus codes to give you something extra when making a deposit! Get promo codes for bingo via SMS, Email, Chat, and our Social profiles. It’s super safe and easy to deposit and withdraw winnings at Robin Hood Bingo. there are many trusted methods to choose from including credit card, debit, paysafecard, entropay, and the most trusted method PayPal! Experience big wins on-the-go when you play mobile bingo with Robin! Simply visit Robinhoodbingo.com from your mobile browser on your smartphone and tablet. You can also get our free mobile bingo app for iOS and bingo from your iPhone and iPad!